In this Aug. 24, 2017, file photo, a sign announcing the store will be closing hangs above a Sears store in Chicago, Illinois. 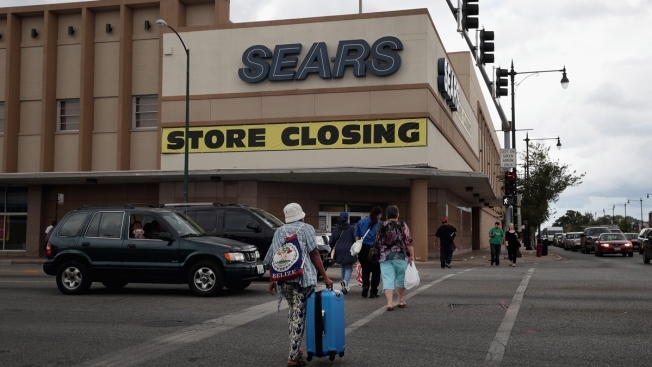 Sears Holdings, which owns both Sears and Kmart, said today it is planning on closing another 72 Sears stores. Sears Holdings announced Thursday that it will close 72 more stores in 2018, CNBC reported. The announcement comes as its same-store sales continue to decline at a double-digit percentage rate. Sears said it has identified 100 non-profitable stores, and will begin to close sales at 72 of them in the near future. Sears and Kmart combined operated about 1,000 locations by the end of 2017, but in January, the embattled department store chain announced that it would close 64 Kmart stores and 39 Sears stores — adding to the hundreds of closures that have happened over the last few years. "We're not liquidating just to liquidate. We're liquidating ... to get capital to put into our pension plan," the company’s CEO told CNBC in a recent interview. "As opposed to erring on the side of, 'This store might work.' ... If it's not working, we've invested the time, so we've got to close it because we are now jeopardizing this [store] over here."